Today's homify tour transports you to Belgium, where the architects and designers behind Open Architectes present a family home with exemplary consideration for healthy human relationships. This rural home embraces a scenic forested hillside location with a generous exterior terrace, coupled with an interior with special attention given to health, connection, and wellbeing. This elevation view shows how the architects have oriented the building to gaze out over the slope, prioritizing the natural view as a defining aspect of the home's placement and design. 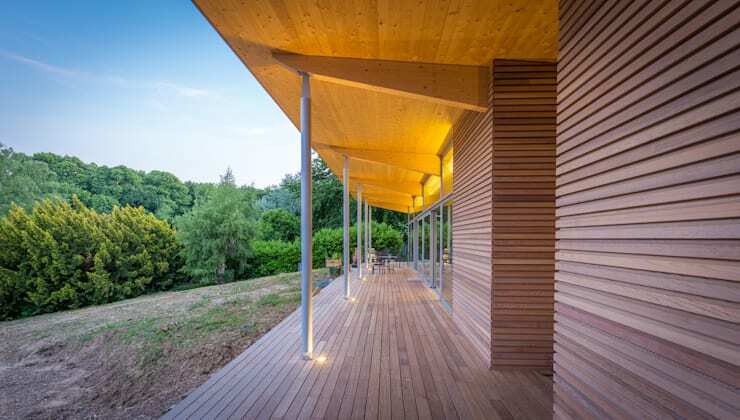 The slanted roof creates a sense of loftiness and freedom as it inclines toward the terrace and scenery beyond, extending energetically in an uplifting angle as it approaches the edge of the building site. Likewise, the angled slope of the roof creates a more intimate and enclosed space towards the rear of the building, where private living areas achieve a more sheltered feeling. The terrace adopts a simple design, achieving a high visual impact through the use of golden lighting on a sleek, reflective ceiling surface. A low-profile design ensures that the structure sits well within the hillside, establishing a healthy consideration for the beauty of the natural scenery. It's impossible not to feel absolutely free when wandering along this terrace. Smooth, golden, and refreshingly unobstructed with railings and furniture, this outdoor spot is ripe for a relaxing yoga session, a sunny nap, or a quiet read in the rain, with little more than a few slim support beams to stand between man and nature. 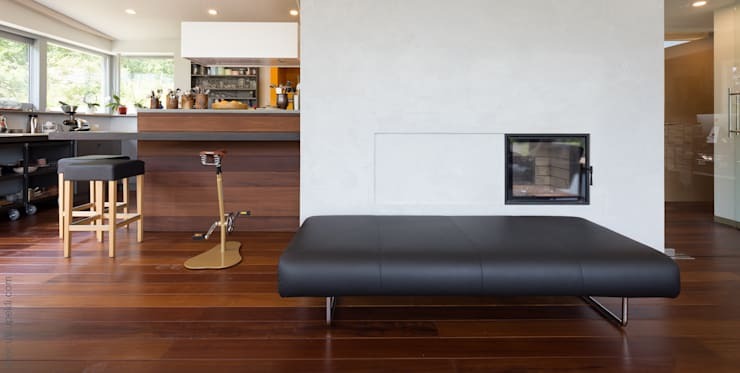 This snapshot of the home's interior is a great example of the way the designers have prioritized health and wellbeing – this unique fireplace design invites you to draw close and enjoy the warmth of the fire. This design offers distinction from conventional schemes that place furniture in a distant and structured position far from the warming comfort of the flames. 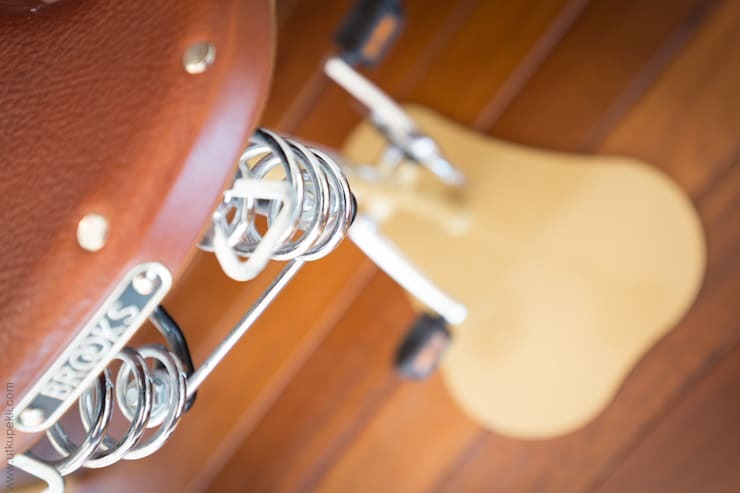 This unique kitchen stool is actually a re-outfitted bicycle, which now serves as a way to squeeze in a bit of physical activity when seated at the kitchen counter. Just another way that this home brings wellbeing to the forefront of it's design! 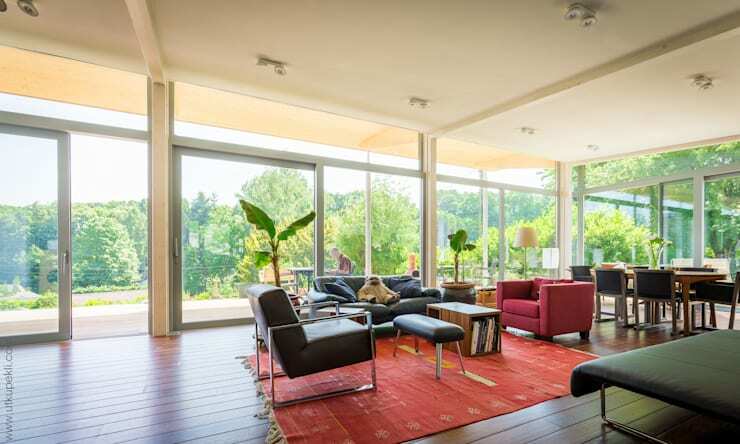 Occupying a sunny corner, the living room boundary has been established through the placement of a red area rug that brings a burst of fiery energy into the room. This unique office design deserves a second glance – the office is housed in a room within a room, so to speak, as an addition set of walls achieving an additional sense of separation from the surrounding area for enhancing workplace concentration. Nearby, a reclining chair demonstrates a clear symbolic balance between work and play – whereas the office room houses a desk, computer, and binders full of folders and files, the adjoining space is filled with high quality speakers, a music collection, and relaxing leather chair. 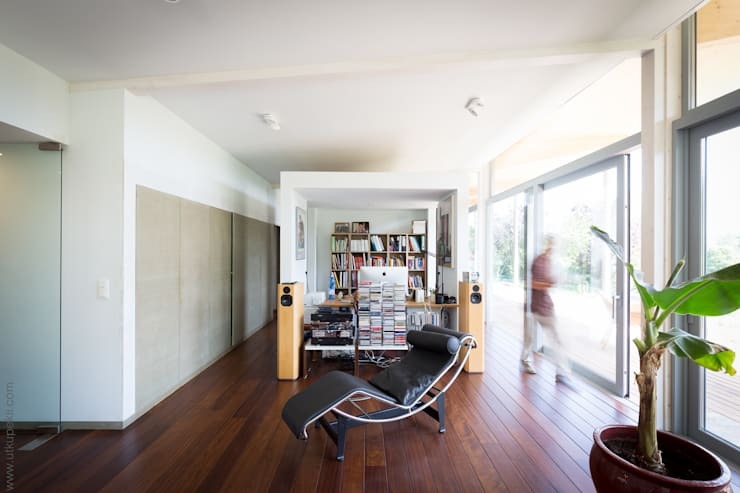 Share your thoughts on this natural home and its wooden terrace, quiet office, and unique bicycle chair below!